I believe that all forms of campaigning are equally effective, be it direct action or festival. It`s like segments in an orange – the ALF have a place withing the movement, and their place is to cause economic sabotage. The Vegan Festivals` aim is to help raise funds for various organistions. There is talk of beginning an annual vegan festival in Ireland, probably in Dublin. What advise would you offer in terms of organising, making a start, size, publicity, and then making it grow into something like the phenomenal success of LVF? It`s important to work within the financial means of the group. Find a suitable location, starting with a hall which will house the amount of people expected to attend. Publicity is the key to a successful event. Do lots of research finding groups, caterers, speakers, etc. We find a small working party works better than a large group. Total committment is very important. Could you tell us what is “vegan street theatre”, which I’ve read you have been involved in organising. In 1984 the group I was in were campaigning against a vivisection lab. We boarded a train and conducted mock experiments. I dressed up as a vivisector and someone else dressed up as a baboon. We repeated this throughout the entire train. Other times we`ve done something similar outside vivisectors homes, and also dressed up in animal costumes in the street protesting against the fur and dairy trades. Robin, could you say something about how the Campaign Against Leather and Fur (CALF) got started? In 1989, myself and Ros were aware that their were no specific campaigns against the leather industry, so we decided to set up a group. We then decided that fur and leather were effectively the same thing – the skins of murdered animals so we combined the two and called the group `Campaign Against Leather & Fur` or CALF. At first we weren`t well received within the AR movement as we were considered single issue (which were never were). However, we were contacted by radio for interviews and some mainstream magazines, and the campaign filtered into the movement. Many non-leather companies followed our lead and now the leather issue is considered to be a natural part of the movement. Can you tell us about the last London Vegan Festival? Who were the guests? Was there any particular presentation which stood out? I`ll have to rack my brain as it seems such a long time ago (last year!). We had some great musicians, and the catrerers were fantastic. Raw Food Creations are particularly popular as well as Veggies Catering. We had talks on a range of subjects as diverse as Plane Stupid, Veganism within Christianity, Freeganism, as well as Lee Hall`s (disrupted) talk, and Mayhew Animal Home. We also had Yoga, meditation classes and massage as well as children`s activities – something for everyone. In an interview about your work with the London Vegan Festival posted at Abolitionist-Online.com, you say: “We try to include everybody who is promoting a vegan cruelty-free way of life”… There are some who would say that in doing so you are sending a confusing message which will lead the public to think that you might support violence and that you might…. …support measures designed solely to improve the lives of other animals before we slaughter them. How would you respond to such criticism? Well, we don`t support violent direct action, but we don`t consider economic sabotage to be violent: the ALFSG support AR prisoners. We welcome anyone who is committed to promoting veganism (except fascists). Our aim is to educate and to encourage people to become vegan. However, there are lots of people out there with differing points of view and we try to appeal to everyone. Quoting Donald Watson, you have argued that ethical veganism is something that could “cure the world ills;” that when someone becomes a vegan consideration of other things automatically fall into place. You describe a domino effect. You suggest that ethical veganism encompasses all the other issues such as animal circuses, vivisection, environmental concerns, etc. Is there any contradiction, therefore, between this priority to promote veganism and your work with CALF, which some may suggest is a problematic single-issue campaign? CALF was never single issue as we have always campaigned against all the issues that you`ve listed. CALF has organised all 12 London Vegan Festivals and they are far from single issue. We believe that `ethical veganism` must embrace ALL issues, and as John Lennon once said `you have to change your head`. Ethical veganism does that. End. The London Vegan Festival attracted 2400 visitors most recently. with the size of the population of London, do you think there’s something to the notion that vegan festivals are just “preaching to the choir”? We think that 2400 individuals is pretty good when the vast majority of people don`t appear to care about anything except themselves. We personally know of several people who have become vegan after attending the festivals. Most people in London whoops…computer glitch. Anyway, as I was saying, the festival serve many purposes : the raise awareness, to help support organisation, and to act as a social base for vegans. End. I attended the anti-fur march in London today and there were lots of young people there. Although I do think that numbers have decreased, there is still a lot of AR activity. The campaigns against vivisection and the fur trade are two in particular. Thatcher did raise heckles, and Blair dampened people`s fighting spirit. However, the AR movement is solid and will continue regardless. End. Robin, you have been in the movement about three decades now. Would you have any suggestions for a new advocate, for someone just making the commitment to animal rights? If there is one vital message a seasoned advocate can offer a new adherent to the cause, what would that be? How did the London Vegan Festival get started? At the Vegan Society AGM in 1996, a proposal was made for an annual vegan event. I suggested a large event which by 1998 became the National Vegan Festival. The first one was organised by a small group of mostly Vegan Society trustees. With other festival appearing around the UK we decided to rename the festival the London Vegan Festival, hoping that more regional festivals would appear. This has come to pass. I don`t think so-called `animal welfare` reforms create vegans. I think they just `allow` non-vegetarians to feel less responsible for animal suffering. I think that there are more vegans because of the work of the Vegan Society, Vegan Campaigns, festivals, food fairs etc. 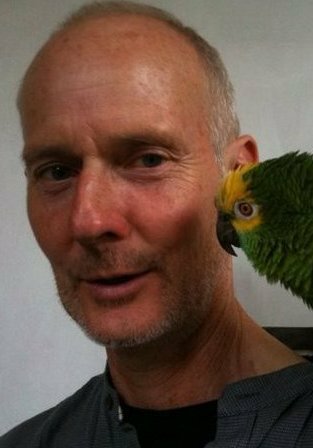 Our intro states: “Robin has campaigned tirelessly for veganism & Animal Rights since the early 80’s, when in 1980, whilst involved in the anti-nuclear movement, Robin became vegetarian. He became vegan two years later, in the same year as becoming active in the animal rights movement.” Did you ever demand payment for ANY of that? I have not claimed any money for any campaigning work I`ve done. Where did you stand on the controversy of using fire when you were ALF spokesperson? I know activists claim that they clear buildings and vehicles before they set them ablaze. Since it is impossible to avoid killing insects and other small animals, what were/are your feeling about the use of arson? That`s a good question. Despite being ALF Press Officer I didn’t personally agree with arson. The so-called incendiary devices were not intended, as far as I knew, to cause fires, but to cause smoke to set off sprinkler systems. Can you say more about “Road Peace,” the lobby for lower road speeds? This sounds like a wonderful idea. RoadPeace (of which I`m a member) is a great organisation who lobby for lower road speeds and who support bereaved families. They supported me when Ros, CALF co-founder, was killed in a road accident. You could bring more people out to a demonstration in the 80’s, but the numbers involved today, by way of the internet, appear impressive as well. Has there been a change in the numbers of activists, or possibly a change in delivery? Numbers are relative…the World Day marches used to attract 7,000 people and now they may attract 1,000. But 1,000 committed AR activists is an impressive amount. The AR movement in the UK has been pretty submissive in recent years due to state repression and the general state of apathy. But we now appear to be entering a different political situation with a government that has declared war on the poor. Earlier this week there was a massive march by students – maybe as many as 50,000 – and a section broke away and attacked the Conservative Party HQ and ransacked the building. There seems to be a lot of anger against the Tories. Do you think any of this will spill over into the AR movement? What can we learn from it? This Government certainly has declared war on the less well-off and I think they should expect more as witnessed by at their HQ. They blamed the riot on anarchists to try to deflect the justified action. I witnessed very strong feelings today on the anti-fur march. Protesters are becoming sick of being manipulated by the government and police. I can see more action coming! Do you think direct actions turn the public against animal rights activists? I don`t think it does. People will support direct action if they feel it justified. People will become vegan when they are sicked by animal abuse regardless. Activists are people who are active, not just people who don`t eat or wear certain items. You have been involved in the AR movement in Britain for many years. What do you think of the fact that anti-vivisection campaigns such as the ones against Covance, Hillgrove, Shamrock and HLS have made no difference to the state of vivisection in the UK? In fact, the use of animals in experiments has actually gone up. Would you comment on that? Do you think that it says something about the fact that single-issue campaigns don’t work? I don’t think about campaigning as being single-issue. Lots of so-called `single issues` make a movement. The government are very powerful, and they are backed by the police and the courts. There are more vegans in the UK now, and it`s become more mainstream. Being a vegan is being active, as is any form of protest. We must all be and stay active in whatever form we feel comfortable with.